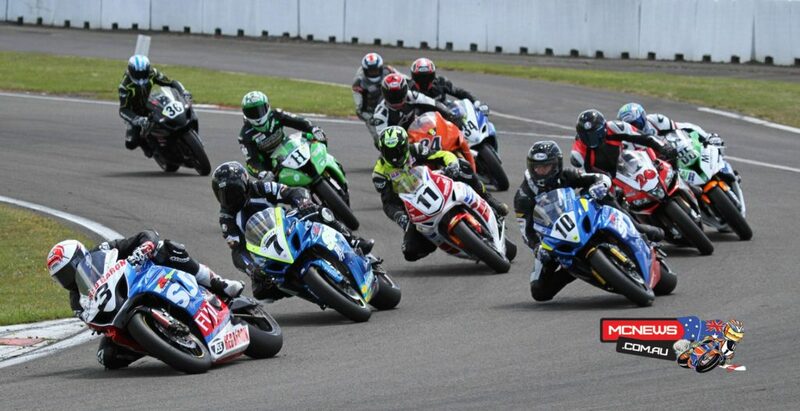 The second round of New Zealand’s 2015 Suzuki Summer Series was played out at Manfeild Park last weekend. Sloan Frost got away first ahead of Scott Moir in the opening Suzuki F1 Superbike race and promptly set about building a large gap on his Fujitsu TSS Red Baron Suzuki NZ GSX-R1000 ahead of a group of riders fighting it out for second position. Suzuki Series leader Horst Saiger made a slow start, however it wasn’t long before he had his Red Devil’s Racing Kawasaki ZX-10R at pace as he worked his way through the field and into second by lap five, then stormed his way towards and then past Frost on the eighth circuit of the 12 lap heat. F1 Superbike front-runners Toby Summer and Jayden Carrick had been unable to make the start line. With his traction control inoperable Frost could do no better than to follow Saiger over the finish line. With Moir holding a solid third, a race long battle developed behind the Penny Homes GSX-R1000 rider between Tony Rees, of Whakatane, and Andrew Stroud, of Hamilton. The trio finished in that order. Tirau’s Dillon Telford was next across the line on his NTB Aprilia NZ RSV-4RF and not far from threatening Stroud by race end. The second F1 Superbike stanza was a near repeat of the first leg with Frost clearing off in the early laps as the pack struggled to make their way past second placed Stroud. Saiger came through the pack from down in fifth and reeled in Frost with three laps remaining. Frost could only stay with Saiger and, although Saiger crossed the line first he had jumped the start and the 20 second penalty pushed his finishing order down to sixth. Saiger set another F1 lap record at 1m 05.008s. Frost was awarded his first win of the Suzuki Series which brings the pair equal on 91 series points to set up for an interesting finale for round three at Whanganui on Boxing Day. Moir rode well for third place until Honda Rider Insurance CBR1000RR mounted Rees caught the Taupo racer napping under unique circumstances on the penultimate lap to fill the official podium positions. Saiger reflects, “It was a pretty good day – I did two times the lap record! In the second race I was really relaxed and I just followed the lights, I saw them dimming so I let the clutch out for a second, then they brightened up again. I don’t know what to say, me I would swear I saw them going out but anyway, I was the only one. After a great start Suzuki NZ GSX-R1000 mounted Stroud dropped down to fourth, and was lucky not to be passed by Telford who enjoyed his best finish of the series. Two key international riders didn’t make the Nationwide Accessories F2 600 start line. German Thomas Wendell’s (Kreutz) rented Yamaha R6 didn’t arrive from Auckland and has left the German without a bike for the rest of the series. Thomas was third in F2 in 2012 and was fourth in the 2013 Suzuki Series. His family are deciding to fly home this week. Suzuki Series F2 leader Swiss rider Roman Stamm suffered heavy bruising to his legs following a fast crash at the ‘Sweeper’ while overtaking a slower rider during qualifying, but is hoping to be fit for Whanganui. With Stamm sidelined the F2 600 races were hard duels between 20 year old Wellingtonian Shane Richardson and Aucklander Daniel Mettam. Richardson was flying on his Motorad Kawasaki ZX-6R but Mettam was still able to put his RCM Suzuki NZ GSX-R600 in front at times during each heated race. Richardson won out after creating a gap leaving Mettam and Whakatane’s Damon Rees to fill the podium. Clive-based Adam Chambers crossed the line a fraction of a second behind on his Wolfpack Racing Honda CBR600RR, while Aaron Hassan, of Auckland was fifth. Steve Bridge enjoyed a great ride for sixth. Race two was cut short when Mettam crashed heavily at Higgins while leading/holding second to Richardson. The pair had been battling at the front from flag-fall as Honda Rider Insurance CBR600RR rider Damon Rees again completed the three-way freight train. Results were counted back a lap giving Mettan the win from Richardson, Rees, Masterton’s Jamie Galway and Connor London fifth on his WIL Sport GSXR600? An injured Mettam was missing from the re-start allowing Richardson to win part two of the F2 600 race ahead of Rees, Chambers, London and Galway. This race was also shortened due to a red flag situation after Rex Mincher fell at the ‘Hairpin’. Tim Reeves showed his world sidecar title winning class after two emphatic wins in blustery conditions during round two of the 2015 Suzuki Series at Manfeild on Sunday. Aaron Lovell and Tracey Bryan took the Quality Inn F1 Sidecar race one holeshot on their Shuzi LCR ‘chair’ and only just held it from the Auckland-based Adam Unsworth/Stu Dawe combination riding an Eni Windle F1 machine. Lovell enjoyed the starts, “I was getting off the line really well as it’s the only chance we have of getting in from of Tim and beat him, but of course he’s still fast around the corners. Our straight line speed is much the same but he’s quite a bit better than us around the corners,” Lovell says. Polesetter Reeves and Wilkes soon got their Carl Cox Motorsport LCR up to speed and shot into the lead on lap two then put on an incredible display of cornering speed not seen in New Zealand before. The duo smashed the sidecar lap record with a 1m 08.958s on their way to an inevitable win by a long margin. It may be a long time before this record is surpassed. Although Lovell (Hamilton) and Bryan (Tauranga) reduced their own lap times the pair remained second and crossed the line ahead of the improving Unsworth/Dawe combination, who enjoyed a race-long battle with Masterton’s Spike Taylor and Astrid Hartnell, and Aucklander ‘Pirate’ Pete Goodwin and Darren Prentis. Unsworth and Dawe grabbed the race two holeshot from the second row of what turned out to be an interesting race, with Lovell and Bryan taking the lead within a few corners as Reeves and Wilkes appeared to be slow off the line. Reeves later revealed that his plan was to get an easy start so he could show the NZ drivers the fastest cornering lines. That plan went out the door when he saw his pit board showing a 20 second penalty due to a jump start. The UK pair immediately put the hammer down with a series of incredibly fast laps as the men from Kent stretched out their lead to 23 seconds ahead of Lovell and Bryan by race end to officially win by just over three seconds! Unsworth and Dawe filled the last podium spot. Taylor and Hartnell brought their Stealth Electric Bikes LCR home in fourth followed by the Corey Winter/Kieran Whitham duo and Perth riders Des Harvey/Dirk Jeal, who were lapped by Reeves. Unbeaten, Reeves and Wilkes lead the Suzuki Series heading into the final round at the famous Cemetery Circuit at Whanganui on Boxing Day, which may see another spectacular performance considering seven-time world champion Reeves has also won at the Isle of Man TT. Reeves said after the race, “In the first race I just got a rubbish start, I don’t know why, then I pushed hard and I was really happy to get a 1m 08s. In the second race I thought we’d have a race with the boys and try to give them a bit of a tow and show them a few lines. But then I came around at the end of the first lap and saw on the board that I’d jumped the start – I don’t know how as I was sixth into the first corner. So it left me with no choice, I had to push as hard as I could – we only won by a few seconds! The ACC “Ride Forever” F3 category provided arguably the closest racing of the day. Leigh Tidman managed to repeat his Hampton Downs double on his Yamaha RS450 and maintains a healthy 26 point margin in the F3 title chase ahead of Gavin Veltmeyer on his Coleman’s Suzuki GVR645. 17 year old Jacob Stroud shot into the lead of the opening race from flag fall however Glen Skachill soon took the lead on his over-bored Honda NS300 two-stroke. Tidman hounded and then passed Skachill with two laps to go, but Skachill’s Honda suffered a fuel issue on the final lap and did not finish, which allowed Stroud to capture second with Roman Rajek a very close third on an RS450. Although Tidman won race two it was no forgone conclusion as he battled the lead with Gavin Veltmeyer, Steve Bridge (self-built Ducati powered VeeArma), Stroud and Skachill in another thrilling race. A small gap formed after Stroud crashed at Higgins which allowed Tidman to take win number four for the Suzuki Series, followed across the line by Veltmeyer, Skachill and Bridge. John Oliver also clocked up his fourth win from as many starts in the Q-west Boat Builders BEARS category, while the action behind came from close scraps between Dwayne Bishop (Aprilia RSV4S ) and Jamie Galway (Triumph 675) in both legs. Former kiwi great John Woodley finished sixth and eighth in the two races on his MV Agusta. Edmonds Painting Supermoto action came thick and fast throughout the large field of riders behind double race winner Richard Dibben, of Whanganui. Reporoa’s Casey Bullock and Tauranga’s Duncan Hart shared second and third place spoils in each race. Eddie Kattenberg leads Paul Russell in the Lyndsay Tait & Associates Post Classics Pre ‘89 series after some serious racing on older machinery at Manfeild. Kattenberg held off Russell in both heats however the result was never settled easily as the pair swapped positions throughout each race. Whangarei rider Duncan Coutts crashed his Suzuki GSX-R1100 while fighting at the front which caused a race one red flag. He recorded second position on count back of a lap and didn’t make race tow due to his injuries. Gian Louie borrowed a standard GSX1100R after engine issues with his own machine and rode very well in race two to finish seventh. Hamilton lawyer Shane Lawrey remains leader of the Pre ’89 Junior series following two wins on his Yamaha FZR600. 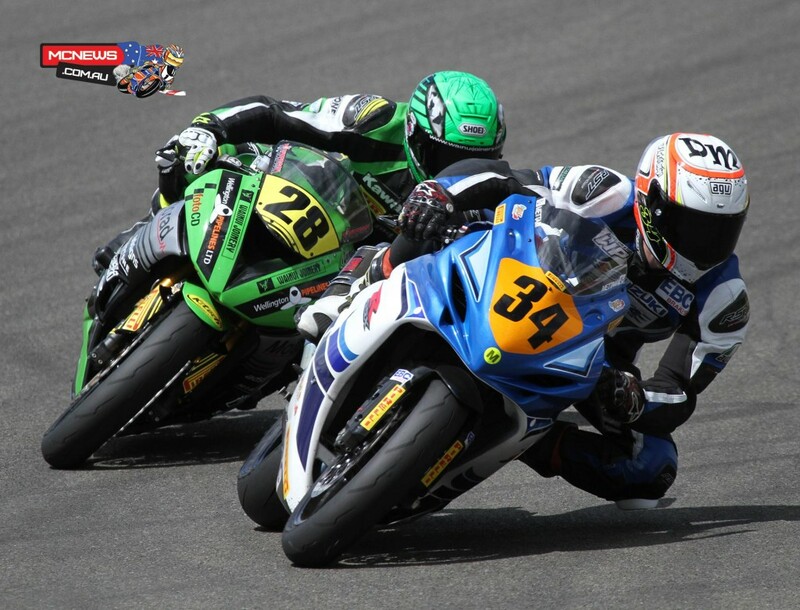 Action in the 2015 Suzuki Series continues with the final round at Whanganui on Boxing Day. Tickets for the Whanganui round are available at www.cemeterycircuit.co.nz and go in the draw after the last race to win a brand new Suzuki UK110 scooter – entrants must be present to win. Quality Inn F1 Sidecars race 1: Tim Reeves/Mark Wilkes (UK, Carl Cox Motorsport LCR), 1; Aaron Lovell/Tracey Bryan (Hamilton/Tauranga, Shuzi LCR Suzuki), 2; Adam Unsworth/Stu Dawe (Auckland, Eni Windle F1), 3; Spike Taylor/Astrid Hartnell (Masterton, Stealth Electric Bikes LCR), 4; Peter Goodwin/Darren Prentis (Auckland), 5. F1 Sidecars race 2: Reeves/Wilkes, 1; Lovell/Bryan, 2; Unsworth/Dawe, 3; Taylor/Hartnell, 4; Corey Winter/Kieran Whitham (Whanganui), 5. F1 Sidecars points: Reeves/Wilkes, 102; Lovell/Bryan, 88; Taylor/Hartnell, 76; Unsworth/Dawe, 72; Winter/Whitham, 59. Suzuki Formula 1 Superbike, race 1: Horst Saiger (Liechtenstein, Red Devil Racing Kawasaki ZX-10R), 1; Sloan Frost, (Wellington, Fujitsu TSS Red Baron Suzuki NZ GSXR1000), 2; Scott Moir (Taupo, Penny Homes Suzuki GSXR1000), 3; Tony Rees (Whakatane, Honda Rider Insurance CBR1000RR), 4; Andrew Stroud (Hamilton, Suzuki NZ GSXR1000), 5. Formula 1 Superbike, race 2: Frost, 1; Rees, 2; Moir, 3; Stroud, 4, Dillon Telford (Tirau, NTB Aprilia NZ RSV4RF), 5. F1 Superbike series points: Saiger & Frost, 91=; Rees, 74.5; Stroud, 74; Moir, 72 James Hoogenboezem (Christchurch, Valvoline M1 Motorsport BMW S1000RR), 52. Nationwide Accessories Formula 2, race 1: Shane Richardson (Wainuiomata, Motorad Kawasaki ZX-6R), 1; Daniel Mettam (Auckland, RCM Suzuki NZ GSXR600), 2; Damon Rees (Whakatane, Honda Rider Insurance CBR600RR), 3; Adam Chambers (Clive, Wolfpack Racing Honda CBR600RR), 4; Aaron Hassan (Auckland, Suzuki GSXR600), 5. Formula 2, race 2-part 1 (half points): Mettam, 1; Richardson, 2; Rees, 3; Jamie Galway (Masterton, Triumph 675), 4; Connor London (Taupo, WIL Sport Suzuki GSXR600), 5. Formula 2, race 2-part 2 (half points): Richardson, 1; Rees, 2; Chambers, 3; London, 4; Galway, 5. Formula 2 series points: Richardson 88.5; Mettam, 79.5; Rees, 77; Chambers, 63.5; London, 62. ACC “Ride Forever” Formula 3, race 1: Leigh Tidman (Taumarunui, Yamaha RS450), 1; Jacob Stroud (Hamilton, Nationwide Accessories Yamaha R6 450), 2; Roman Rajek ( Taupo, Wolfpack Racing RS450), 3; Daniel Mettam (Auckland, RCM Suzuki NZ GSXR450), 4; Gavin Veltmeyer (Auckland, Coleman’s Suzuki GVR645), 5. Formula 3, race 2: Tidman, 1; Veltmeyer, 2; Glen Skachill (Wellington, Moto TT Honda NSR300), 3; Steve Bridge (Ngaruawahia, VeeArma F7 Mk2), 4; Ashley Payne ( Whanganui, Suzuki GSXR450), 5. Formula 3 series points: Tidman, 100; Veltmeyer, 74; Stroud, 68; Bridge, 58; Robert Whittall (Raglan, NTB Aprilia SXV550), 55. Edmonds Painting Supermoto race 1: Richard Dibben (Whanganui, Tyresheild 450), 1; Casey Bullock (Reporoa, KTM450), 2; Duncan Hart (Tauranga, Mimico Yamaha YZF450), 3; Glenn Haden (Dyno Lab Suzuki RMZ450), 4; Aden Brown (Whanganui, Harvey Round Motors RMZ450), 5. Supermoto race 2: Dibben, 1; Hart, 2; Bullock, 3; Haden, 4; Brown, 5. Supermoto series points: Dibben, 102; Hart & Bullock, 84=; Haden, 72; Brown, 64. Lyndsay Tait & Associates Post Classic Pre ’89 Senior race 1: Eddie Kattenberg (Te Awanga, Bimota YB8), 1; Duncan Coutts (Whangarei, Suzuki GSXR1100), 2; Paul Russell (Auckland, Suzuki GSXR1100), 3; Sean Donnelly (Paraparaumu, Kawasaki Z1000R), 4; Paul Wootton (Waikane, Suzuki GSXR1100), 5. Post Classic Pre ’89 Senior race 2: Kattenberg, 1; Russell, 2; Wootton, 3; Donnelly, 4; Dave Freeman (Paraparaumu, Harris GSX1100), 5. Post Classic Pre ’89 Senior series points: Kattenberg, 102; Russell, 86; Wootton, 67; Gian Louie (Hastings, Suzuki GSXR1100), 66; Donnelly, 64. Lyndsay Tait & Associates Post Classic Junior race 1: Terry Moran (Wellington, Kawasaki ZZR600), 1; Shayne Lawrey (Hamilton, Yamaha FZR600), 2; Steven Gregg (Masterton, Honda CBR600), 3; Steve Clarke (Masterton, Honda), 4; S J Cavell (Napier, Honda VFR400), 5. Post Classic Junior race 2: Lawrey, 1; Gregg, 2; Moran, 3: Nigel Lennox (Auckland, Honda), 4; Clarke, 5. Post Classic Junior series points: Lawrey, 97; Moran, 87; Gregg, 84; Lennox, 65; Cavell, 61. .
Q-west Boat Builders BEARS race 1: John Oliver (Feilding, BMW S1000RR), 1; Dwayne Bishop (Whanganui, Aprilia RSV4), 2; Jamie Galway (Masterton, Triumph 675), 3; Rogan Chandler (Upper Hutt, Triumph 675R), 4; Shaun Manson (BMW S1000R), 5. BEARS race 2: Oliver, 1; Bishop, 2; Galway, 3; Chandler, 4; Jason Bardell (Whanganui, BMW S1000RR), 5. BEARS series points: Oliver, 102; Bishop, 88; Bardell, 68; Manson, 66; Stephen Leggett (Auckland, Aprilia RSV4 S), 65; John Woodley (Australia, MV Agusta F4 1000), 59.